The last thing I need is more fabric for Spring and Summer dresses, but try telling that to my rational side. She doesn’t listen. So last Fall, when I saw a cotton sateen in a large navy, orange and white floral print in the Etsy Store of Promenade Fabrics, and it was the last yardage on the bolt, I decided I had better act fast and put it in my “cart.” I certainly was not disappointed when it arrived, as it was beautiful quality, with a slight stretch to it, and the colors were just as dramatic as I had hoped they would be. I forgot to take a photo of the fabric, so here is the finished dress instead. 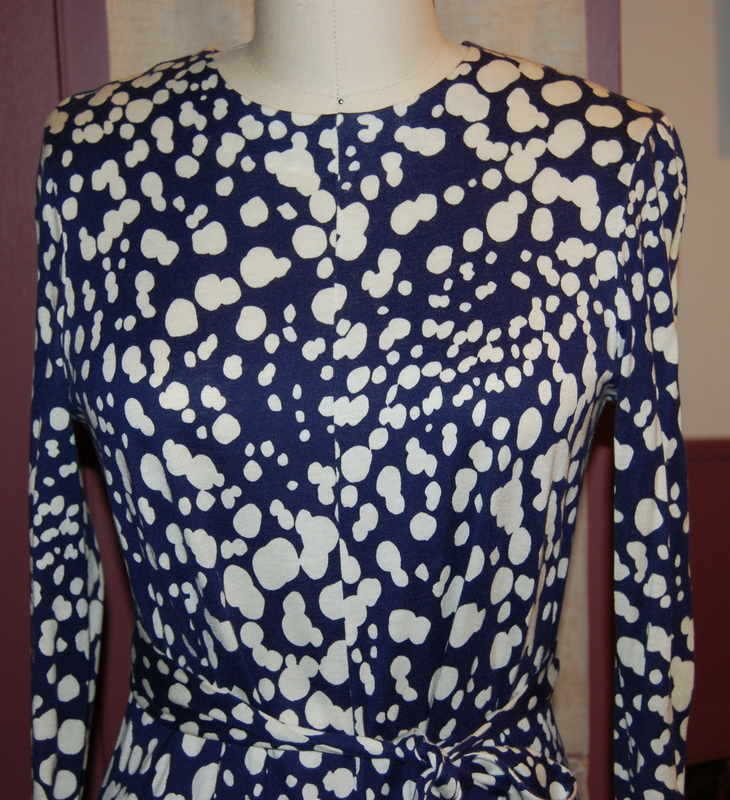 The Simplicity “version” of the Diane von Furstenberg wrap dress. Obviously, I intended to make this sleeveless. 1) reduce the flare of the skirt by about 9 inches. 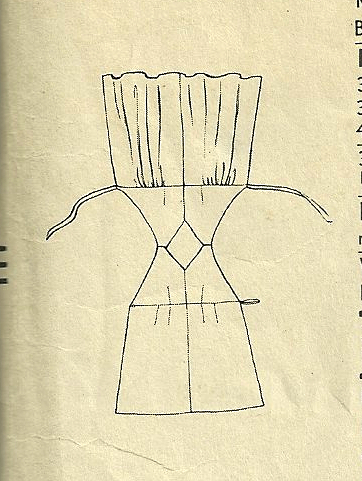 2) eliminate the facings and, instead, line the bodice. 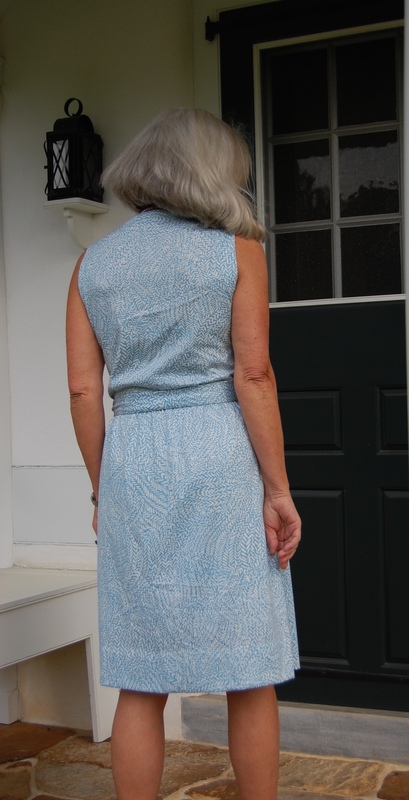 The lined bodice, with that snap I always have to add to the front closure of wrap dresses! The shortened length of the ties means I cannot tie a bow, just a knot, but that’s okay! I was so glad I managed to squeak out the collar! 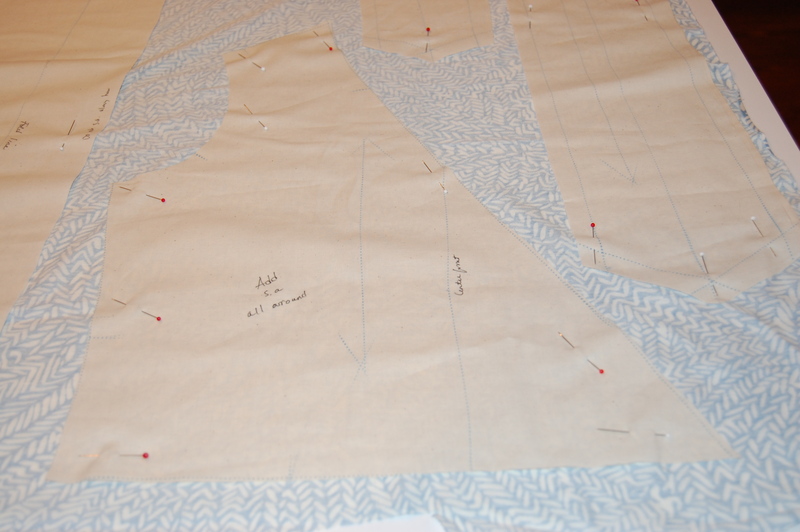 Back to my story – with my fabric all cut and ready to sew, one would think this dress would speed right along. And it would have, except that about this time we were getting our porch furniture out of storage in our garage. I had forgotten that our porch cushions and pillows had looked so awful last year that I didn’t even want to use them. This was the year I needed to do a major home sewing job and recover those cushions and pillows. So that’s what I did. By the time I got back to my wrap dress, my momentum was definitely lacking speed, and then the mystery was just how I was going to get excited about completing it! I have to say the only thing which kept me focused on finishing this dress was the fact that I have so many other projects in my queue. Now that it is finished, I am so glad I pushed through! Such a windy day – a good test for a wrap dress! This is a good basic Summer dress! 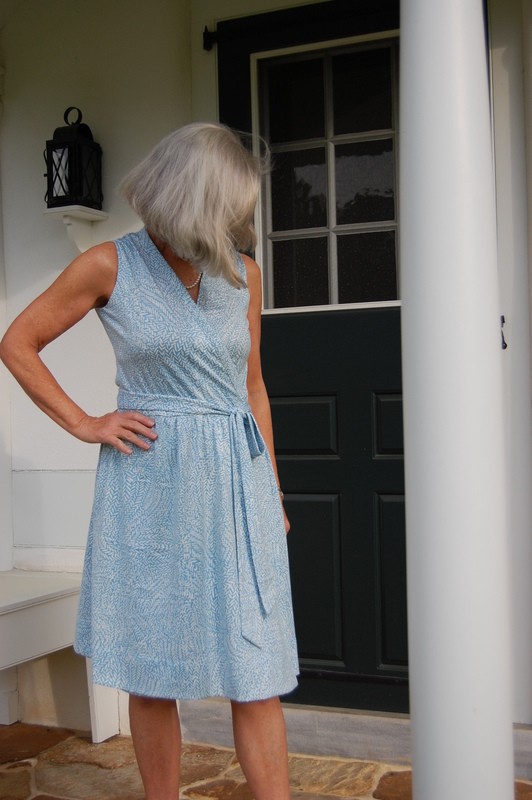 One thing that is not a mystery – I think I am finished with making wrap dresses for a while! The selvedge clearly states the DvF connection. How I waited THIS LONG to make this dress, I’ll never know, but now it is reality! Worn with the V and wrap to the back. Worn with the V and wrap to the front. DvF-designed Cohama knit fabric is a lovely cotton/rayon blend, very soft and surprisingly easy to sew. I am not a big fan – or any fan at all, really – of sewing with knits, so I appreciate that this fabric is so accommodating. One downside of sewing with knits that I can’t quite get around is the fact that it is almost impossible to make a muslin mock-up to try out the fit and sizing. Perhaps someone knows some trick that I don’t know, but I felt a little like I was flying blind when making adjustments to the pattern which I would need for the proper fit. These included 1) lengthening the bodice by about an inch (which I know needs to be done from other wrap dresses I have made), 2) shortening the sleeves to three-quarter length and adding a little bit of width to them so they could be pushed up comfortably, and 3) adding about an inch and a half to the diameter of the waistline. Even with the forgiving nature of a knit fabric, I am not comfortable making a dress without a proper muslin first – so I was a little bit nervous the whole way through the construction of this dress. I followed the instructions carefully, and was fascinated to find that all the seams needed to be double-stitched, trimmed and pressed to one side. I discovered the reason for this after the dress was finished – it helps make the dress truly reversible, in some magical way. A side and waist seam detail. Yes, this dress has pockets – two of them! 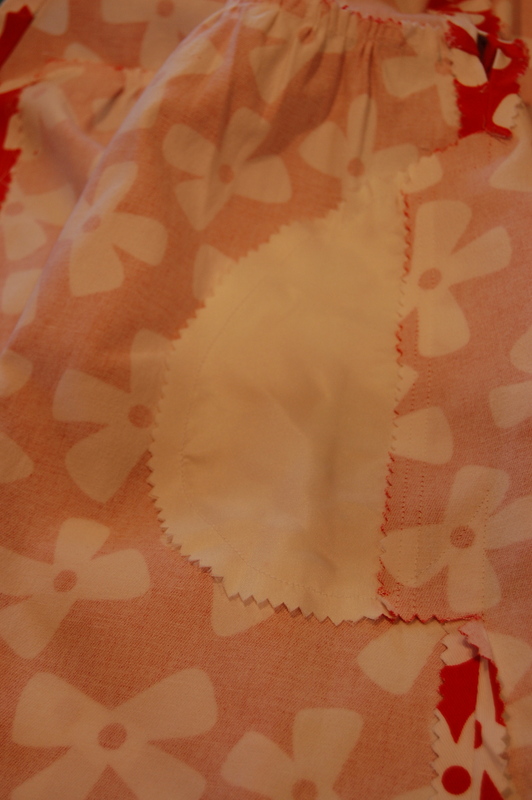 I did, however, use my trusty Snug Hug seam binding for the front skirt facings and the hem. 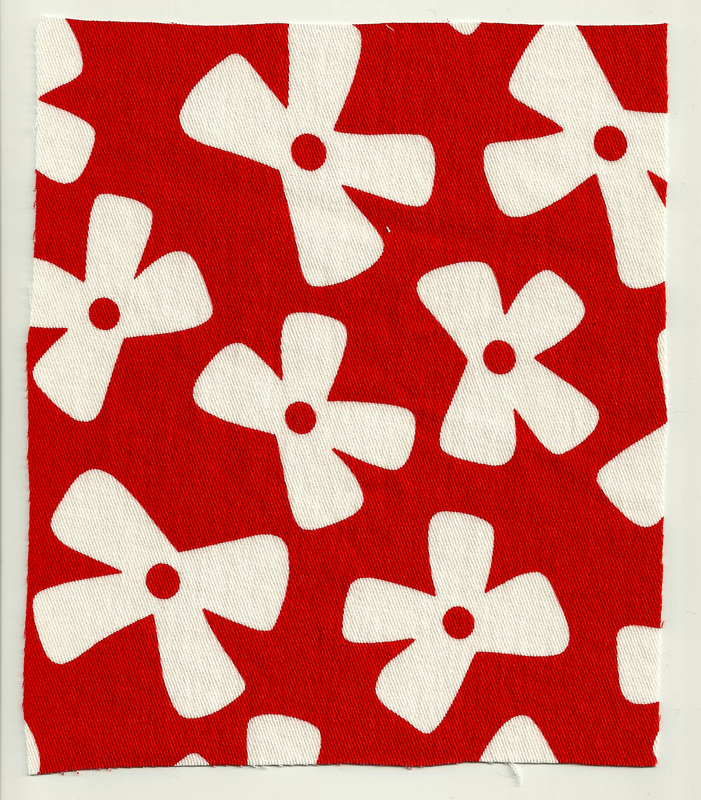 I needed an iron-on interfacing suitable for use with knits and after some research came up with Heat-n-Bond Fusible tricot (purchased from Fabrics.com.) This is the perfect interfacing for use with knits as it stretches, but also stabilizes. I used it for the neck and front facings per the pattern instructions, and I also reinforced the hems in the sleeves. The pattern called for under-stitching the front and neck facing, and I could not help myself – I did it by hand rather than machine! Hand finishing is just so much nicer! Plunge is right! When I tried on the dress with the wrap to the front, I decided I was going to have to add a modesty panel or a very strong snap to keep the front closed. I opted for the snap, but I’m not entirely happy with the way it looks. I should have taken a closeup of the bodice! There seem to be a few wrinkles across the back. I so prefer three-quarter length sleeves rather than long sleeves, particularly in a dress like this which will be worn in the warmer months. When I tried on the dress with the wrap to the back, I loved it, and I felt like it fit me better, especially across the shoulders. The back without the snap fastened. Now the dilemma: I need the snap for the front V, but I don’t need it for the back V, nor can I reach it by myself in the back to fasten it. But one half of the snap shows when the V is in the back, which obviously will not do! If I take the snap off, I cannot wear the dress with the front V (which is a little more casual look.) If I leave the snap on, I cannot wear the dress with the back V (a little dressier look.) Maybe I should forgo the snap and make a modesty panel, which can fasten underneath and be removed when I wear the dress “backwards.” Any thoughts, anyone?? I guess I have the advantage of time on my side to figure this out, as I probably will not, at this point, be wearing this dress until next Spring. Despite this one little gaping issue, I think this dress is beautiful, versatile, comfortable and very feminine! Hooray for Diane von Furstenberg, vintage Vogue Patterns and vintage Cohama fabrics – some styles never get old! The pattern itself is shown here in diagram form, for those of you who have never seen, nor sewn with, a DvF Vogue pattern. As you can see, there are minimal pieces. I don’t believe you get the sense of how long the ties are from this diagram. Each tie is 50” long, giving the wearer plenty of length to go around her waist, doubling up for part of the front, and still have enough to make a bow or loop with long ends. I made two minor changes to the pattern from my first version of this dress three years ago: I cut the shoulders in about an inch, which I think is a more pleasing and up-to-date look. I also added ¾” to the bodice in length. For some reason, I find that wrap dresses tend to be either short-waisted or they do not allow for the fact that the ties are going around the waist twice, pulling up the skirt a small amount. Whatever the reason, the extra ¾” seems to fix the problem. 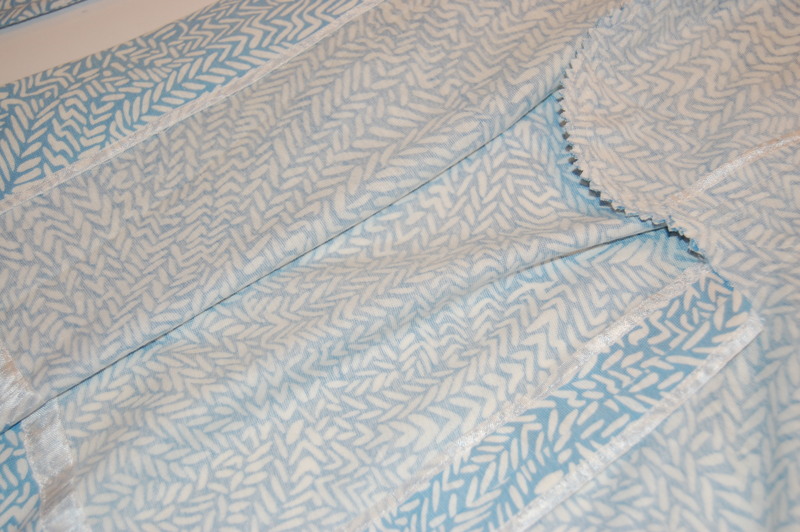 I also decided to try finishing the interior seams with Hug Snug rayon binding – and it worked beautifully. I love the clean, neat finish on these seams, and the soft tape helps to keep the seams from curling in. I made one last addition to this project: a simple hand-inked label to indicate when this dress was made, sewn onto one of the pocket selvedges. With vintage fabric and made from a vintage pattern, this dress could be mistakenly attributed to having been made in 1976. This label will help to insure that that never happens. Every Spring deserves one easy dress, but now it is time to move on to something a little less breezy, and a little more complicated. What will that be? Has there ever been a more iconic cover for a pattern/sewing magazine? Long sleeved and with a separate tie belt. There is a center front seam to this dress which helps to make the skirt flow beautifully. The label gives some fascinating information. 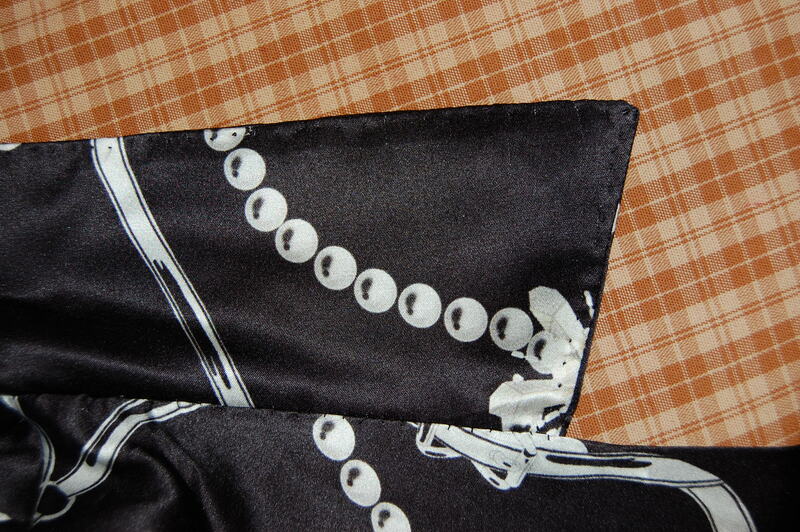 It gives the composition of the fabric, – 50% cotton and 50% rayon. Interestingly, it includes an “umlaut” over the “u” in Furstenberg, which seems to have been dropped shortly thereafter. And the size 10 would now be a size 6 in USA standards! “Almost as important as the designs are the Diane-designed prints which turn her very flattering basic designs into that very special Von Furstenberg look. 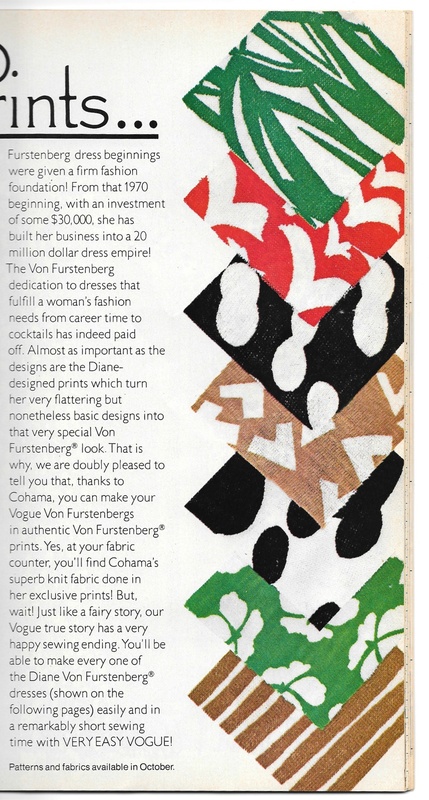 That is why, we are doubly pleased to tell you that, thanks to Cohama, you can make your Vogue Von Furstenberg in authentic Von Furstenberg prints.” First available in October 1976, many of these prints are still recognizable today as DvF prints, and they still look fresh and stylish! A sampling of some DvF fabrics. Here is the editor-in-chief of Vogue Pattern Magazine, Judy Espinar, with Diane von Furstenberg. 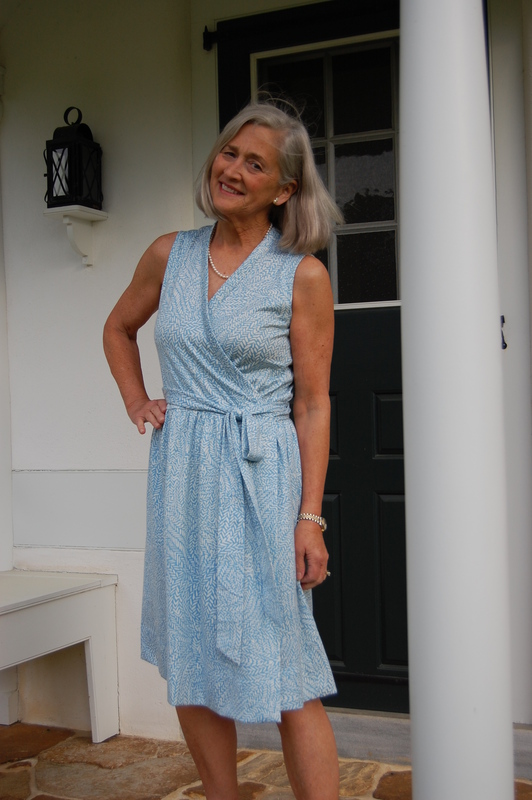 I might not have been able to get my hands on any of that Cohama fabric back in the 1970s, but thanks to this blog and one of my readers with unused DvF yardages, I have been able to fulfill a long-held wish, having purchased two lengths of the Cohama fabric a number of months ago. I washed it in cold water, gentle cycle, and it came out fresh and like new. I was struck by the quality of the knit fabric, and of course, wanted to know its composition. This is another time when the vintage Vogue Pattern Magazines come in so handy. Each featured pattern is pictured in thumb-nail size in a detailed Patterns Guide in the back of the magazine, giving information on fabrics, accessories, yardages needed, etc. Quickly I was able to determine that the Cohama fabric is Avril II rayon/cotton knit. This fabric is lighter in weight than my “store-bought” DvF dress. 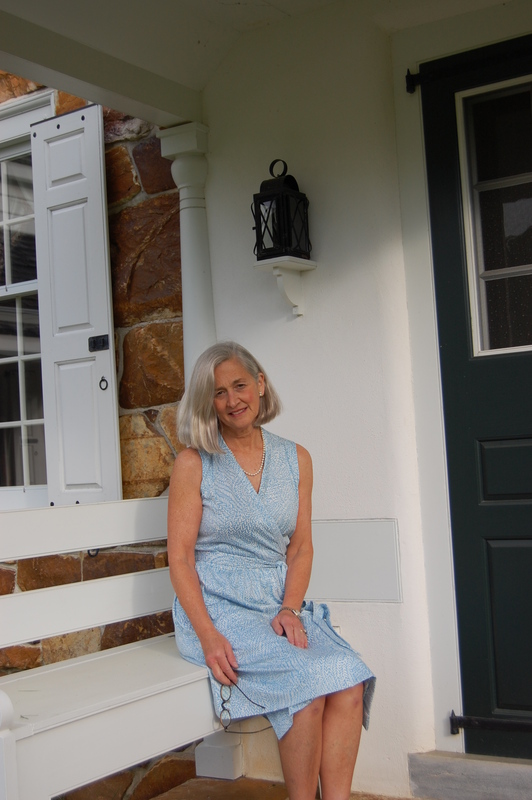 It is tightly knit, silky soft, and, like my “store-bought” dress, it cannot be “seen through,” making it easy to wear! 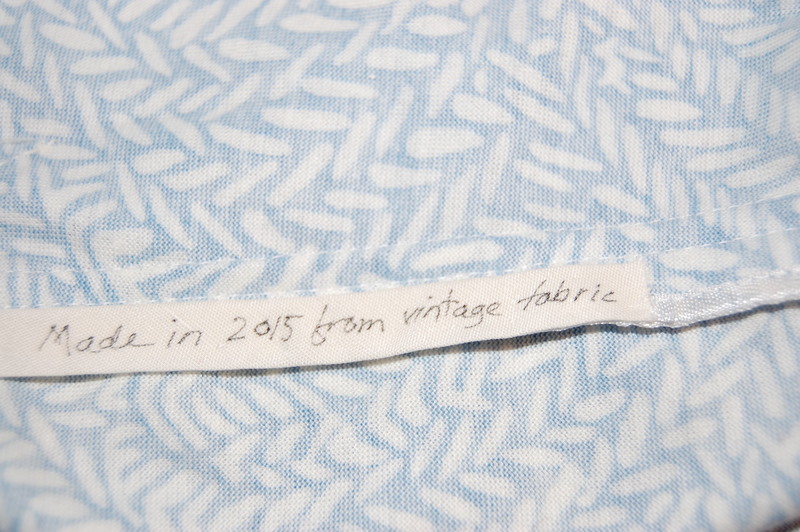 Along the selvedge – the mark of an authentic DvF print! 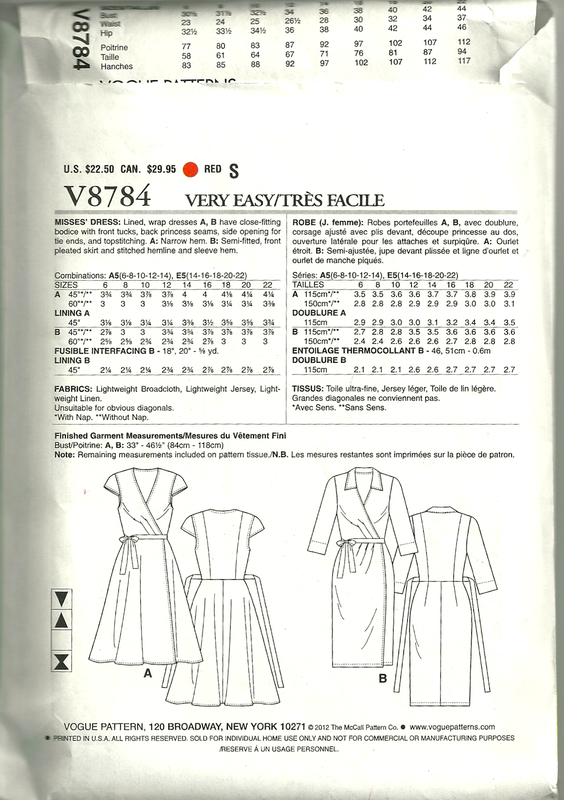 I had already made a dress from this pattern three years ago. I have enjoyed wearing it, although the fabric is a bit heavy for the design. So I thought it would be good to make it again, this time in my authentic DvF print. I also determined that I had just enough fabric to squeak out this dress in the short sleeveless version. These wrap dresses take an enormous amount of fabric! It makes sense when you think about the overlapping necessary to make the dress wearable. When I spread out my fabric, I thought to myself, “Oh, I have lots of this – no problem!” I should have learned by now not to think such things! It quickly became apparent that I would have to be creative (again!) in my lay-out if I were to be able to make this dress. First I made a muslin pattern with separate pieces for the reverses. This was so I could lay the pattern pieces out singly, not folded. Ever since sewing with Susan Khalje’s couture techniques, this is how I like to cut my fabric anyway, so I am accustomed to this extra step. But this time, I cut off the seam allowances (except on the long belt pieces), just as you would do when you are making a classic French jacket. 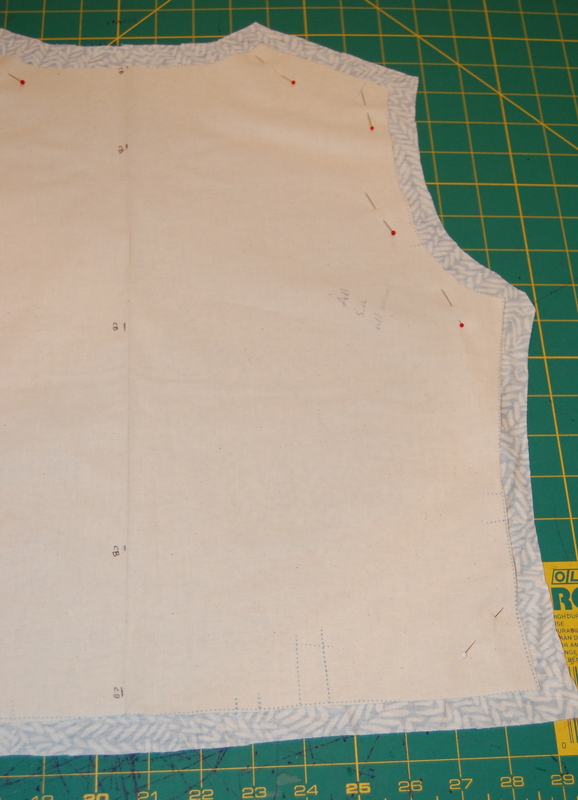 The back bodice piece, ready for thread tracing on the sewing lines. I am excited about this dress! Since I have already made this pattern once, I know what needs to be tweaked. And – I am excited that I do not have to line it, it has no buttons or buttonholes, and I know it will be easy-wearing. That, to me, is a formula for fashion sewing success. Among timeless fashion statements, pearls and wrap dresses both make my top-ten list. The opportunity to combine the two was just too good to pass by, especially after being inspired by a silk charmeuse perfectly suited for just such a pairing. 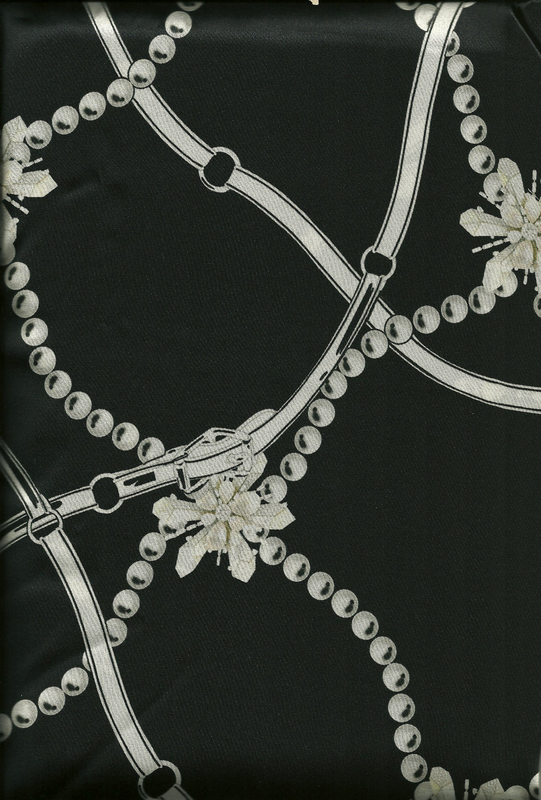 Pearls and ribbons and clusters, fabric purchased from Mendel Goldberg Fabrics in NYC. 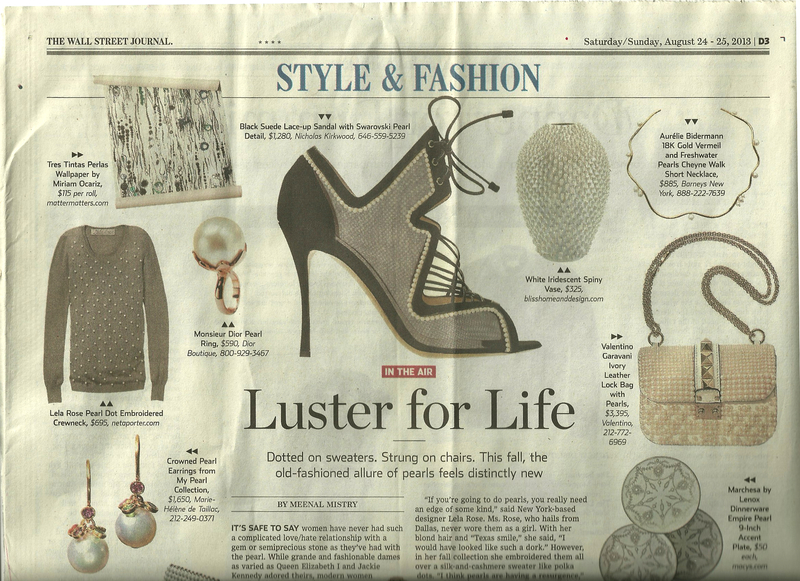 As luck would have it, shortly after I purchased the silk for this dress, an entire article in the Style & Fashion section of The Weekend Wall Street Journal of August 24 – 25 (2013) was devoted to “the old-fashioned allure of pearls…” It seems that pearls are “showing up on everything from shoes to wallpaper to chairs” – and to fabric, as evidenced by my Italian silk charmeuse. I am just “old-fashioned” enough to think that pearls are never not in style, but I must admit that even I was smitten with the unusual and modern approach of this fabric design. Pearls are showing up everywhere, it seems. 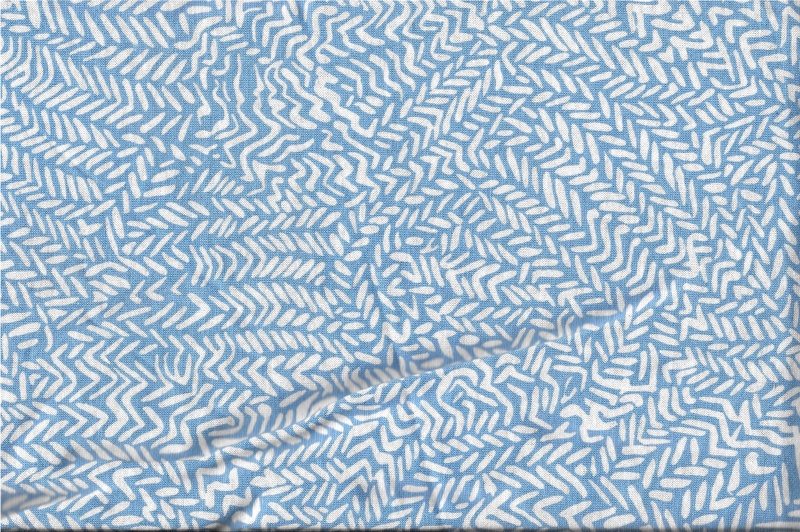 So – how would this modern fabric look, made up in a mid-1970s’ wrap dress pattern? I thought it would work quite well. But getting there turned out to be challenge. 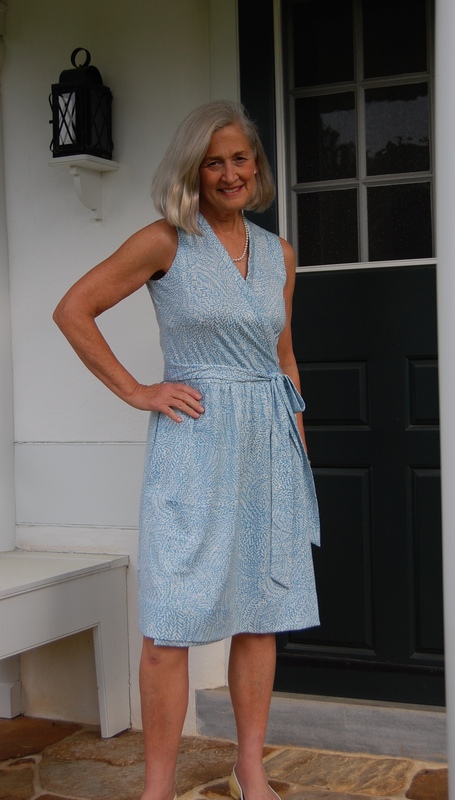 Although I was lacking the classic Diane von Furstenberg wrap dress pattern that I envisioned for this dress (blogged about here), I thought I could piece together a 1976 Simplicity version and a new Vogue wrap dress pattern to achieve my goal. The Simplicity “version” of the Diane von Furstenberg wrap dress. 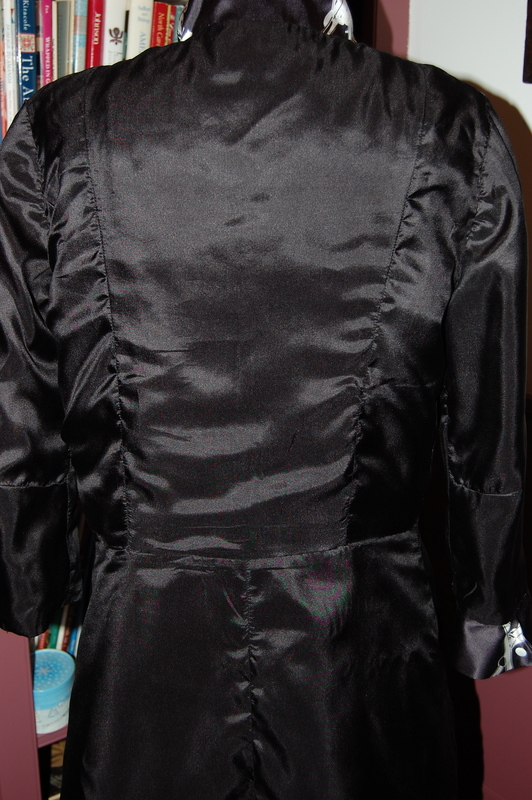 1) I decided to use the princess-seamed bodice back from the new Vogue pattern. 2) I re-cut the collar and the cuffs from the Simplicity pattern so that the points on them would not so extreme. 3) Because the ties on the Simplicity pattern were not attached to the dress (the tie was just like a very long separate sash) I used the ties from this DvF pattern, and attached them to the side seams. 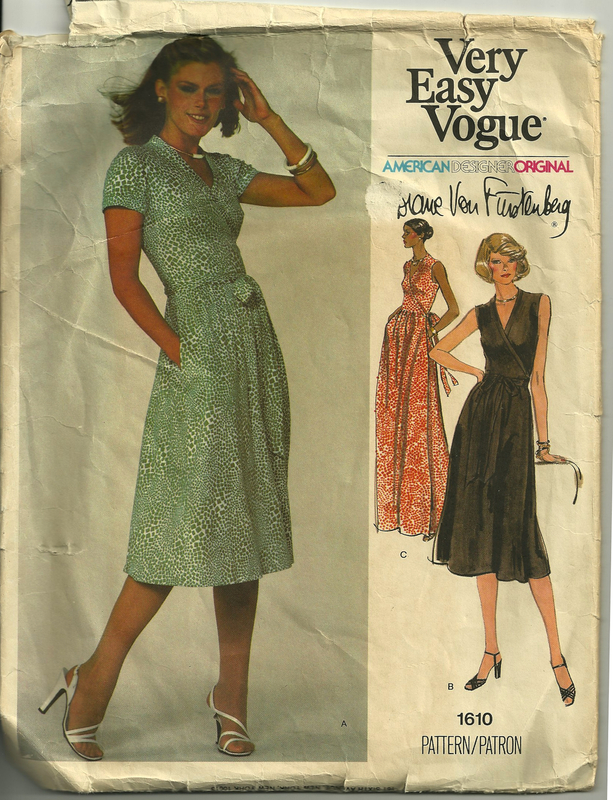 4) The missing sleeve pattern piece in the Simplicity pattern meant that I had to use the sleeve from the new Vogue pattern and basically redraft it, with an elbow dart, and with cuffs. 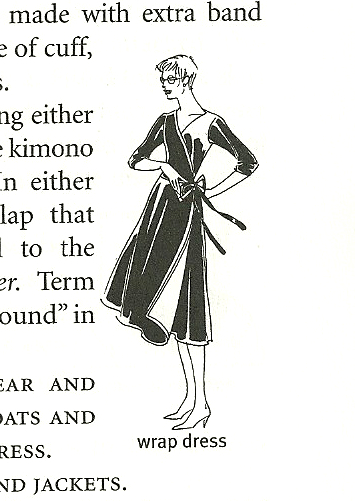 I also used Simon Henry’s book The Little Black Dress: How to make the perfect one for you as a reference. This is the wrap LBD dress featured in the book. 5) I ended up making two complete muslins and re-stitching one of those muslins, before I had a workable pattern. All of this seemed to take forever! When I finally cut out the black silk organza underlining, I was ready for a celebration, but of course, that would have been premature. 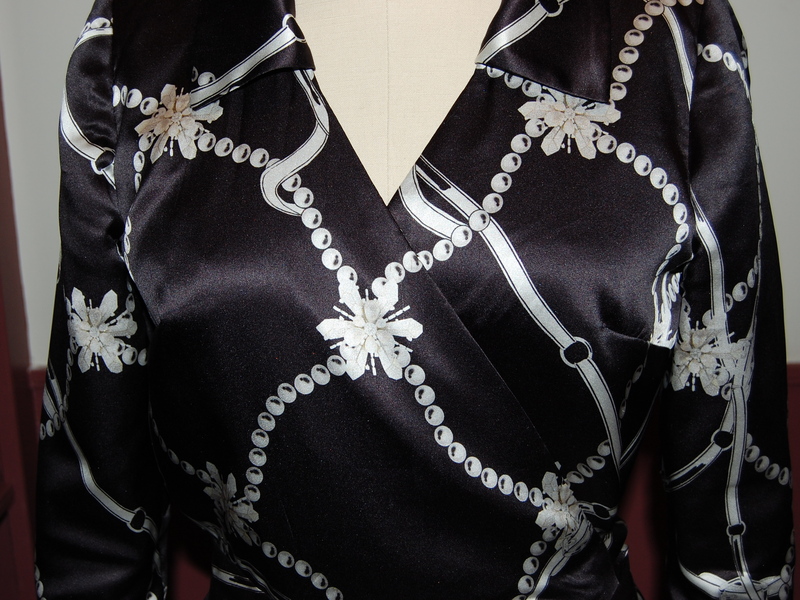 Although the design in the fashion fabric really could not be “matched”, I still had to respect the placement of the “clusters” as they would relate to the bodice. (I did not want “clusters” at the apex of the bust darts, for example.) And I felt like the “clusters” should be placed at equal distances from each other over the expanse of the dress, if possible. After determining all this and cutting out the fashion fabric, I finally got to sewing, which included lots of basting, catch-stitching all the seams to the underlining, understitching the collar by hand (which worked beautifully, for which I was very grateful! ), setting in the sleeves, making the lining, etc., etc. Here is the final placement of the fabric design on the front of the bodice . . .
. . . and here is the bodice back. Understitching the collar created a slight under-curve which helps the collar lay flat. This boring view just shows the lining that was so tedious to attach! I made the mistake of making the cuffs before a final fitting of the sleeves. (I thought I was being smart and getting “prep” work done, but I just made more work for myself). I ended up shortening the sleeves and enlargening the openings so that I would be able to push them up on my arms if I wanted to. 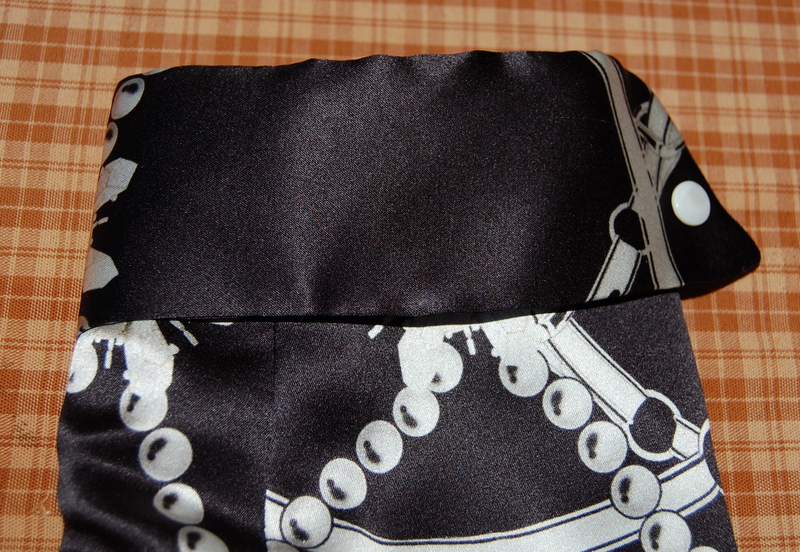 The cuffs I had made were not long enough to accommodate these adjustments, so back I went to cut and make new cuffs. Fortunately I had just enough fabric to squeeze these out! The original price of these buttons was 10 cents. I picked them up for 50 cents at some point. It almost seemed a shame to cut them off of the card! Because I had reduced the points on the cuffs, I needed “not-too-big” buttons and these proved to be perfect, I thought, and in keeping with the “pearl” theme. Here is one of the cuffs with buttons attached. Working on the black fashion and lining fabrics was tedious. And it seemed the more I worked on this dress, the more there was to do on it! Kind of like eating a big bowl of pasta – the work seemed to multiply before my eyes. Fast, easy, and jiffy this was not! It’s times like this that being of a stubborn nature serves me well. I persevered and got it done! And even better, I am really happy with the results. Here is the dress on my new dress form . . .
. . . and here it is on ME! Now – two more “P” words. I have “P”romised myself that my next “P”roject will be simple. Maybe a blouse – or even a blanket? I am not sure why, but I have been obsessed with wrap dresses lately. 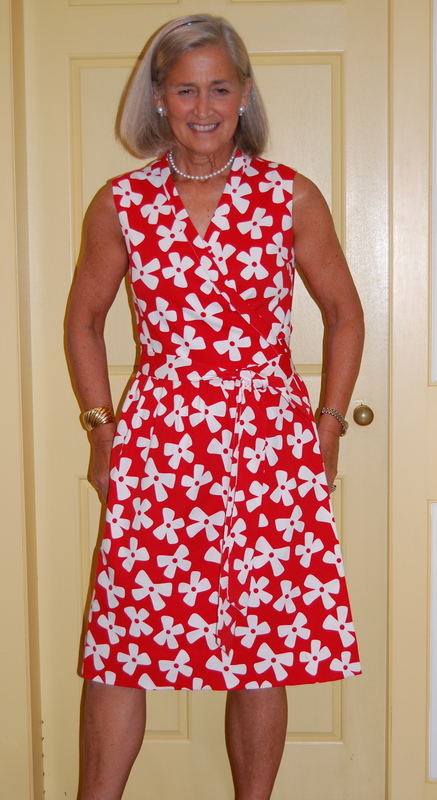 I think it began in May when I wore the dress I made last summer from a mid-‘70s Vogue Diane von Furstenberg pattern. It seemed to make a hit whenever I had it on – and there is nothing like a compliment to make one try for a repeat! I just needed to find the perfect fabric – and another perfect pattern. I made the sleeveless version of this dress in a red and white print. I loved the design so much that I asked for a swatch of it while I was at Mendel Goldberg Fabrics in NYC with my classmates. Well, you can guess the end of this part of the story. A few weeks after arriving home, I called up Alice at Mendel Goldberg and ordered some yardage. I could picture this fabric as a wrap dress with ¾ or bracelet-length sleeves. 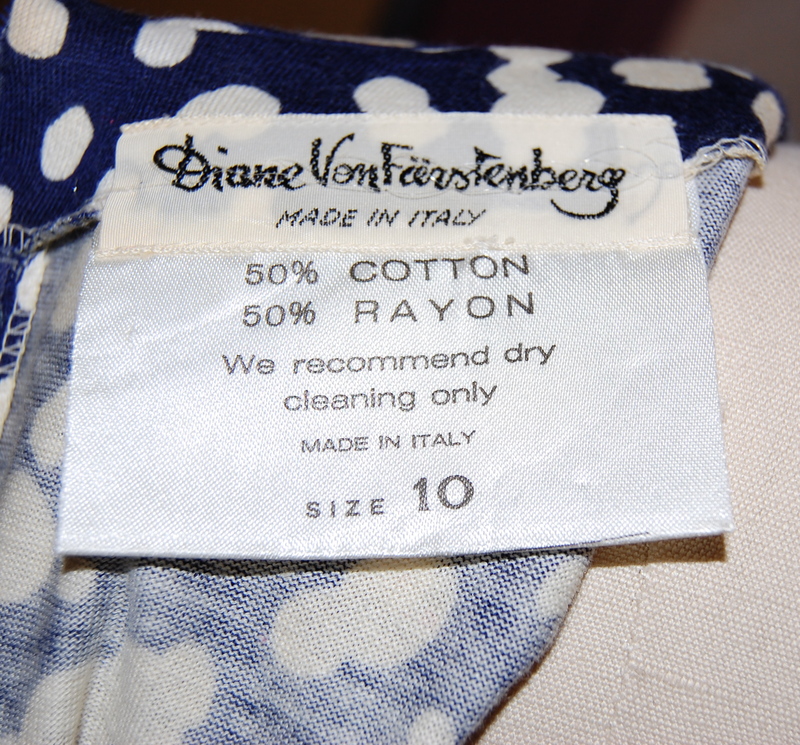 However, it is a woven fabric (of course), and even though it does have a slight stretch to it, those vintage Diane von Furstenberg patterns require “stretchable knits”, even including a stretch gauge on the pattern envelopes to ensure success. 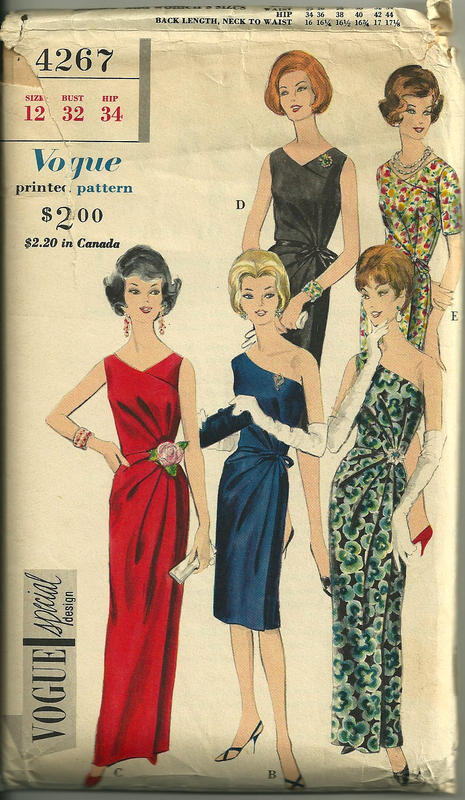 Out of curiosity I went through my collection of vintage patterns to see what other “wrap” dresses I could find, and although none of these three were quite the look I wanted, I was struck by the variety of wrap dress patterns available, obviously some long before Diane von Furstenberg made them so popular. Actually, just the skirt is a wrap on this dress, which has so many different looks, all of them quite stunning. 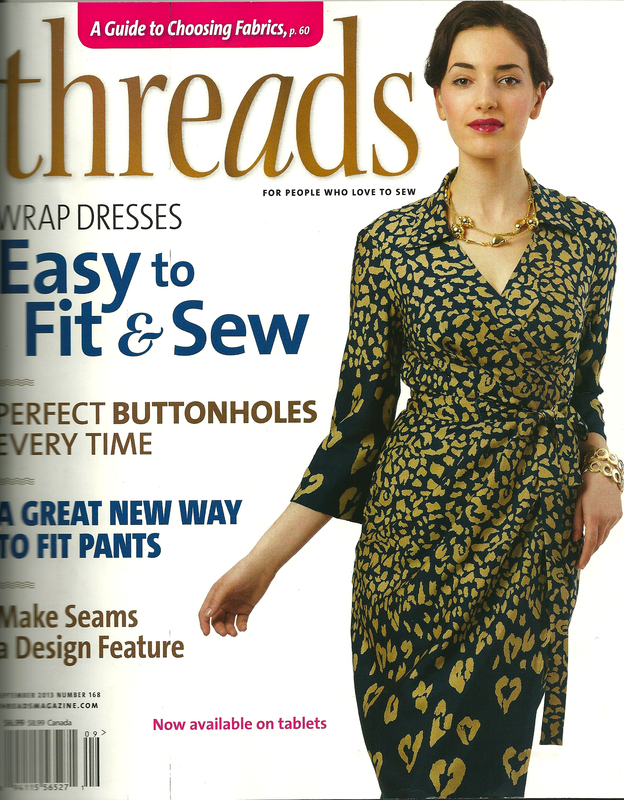 It was about this time that the September issue of Threads magazine arrived in my mailbox. 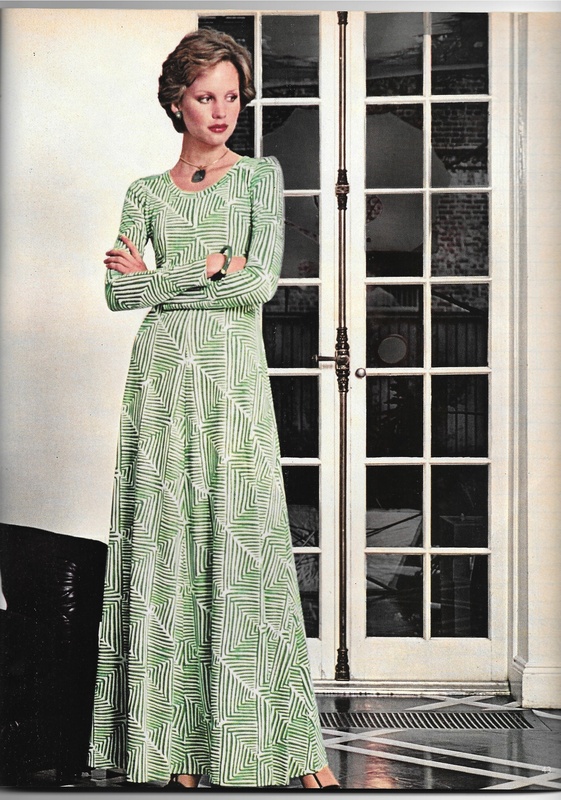 Now my obsession was in full force, as the main feature article was on Wrap Dresses: Easy to Fit and Sew. 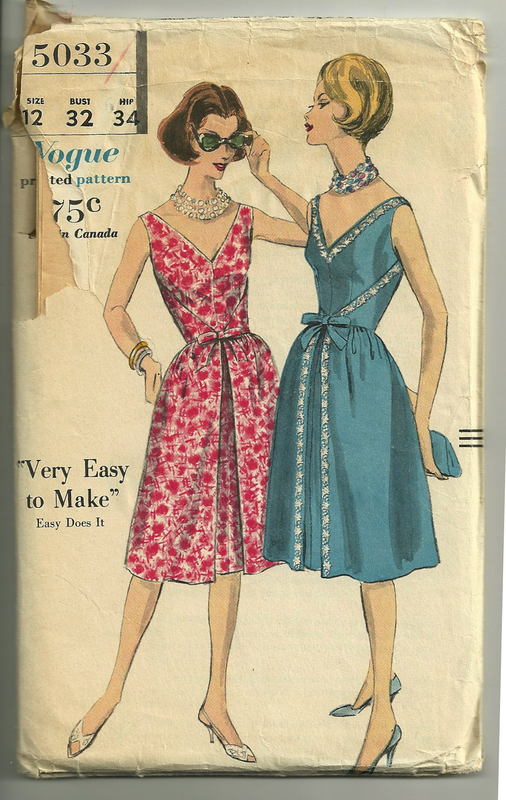 I liked the dress featured on the cover – which happens to be a new Vogue pattern (V8784). I also liked the fact that it does not require a knit fabric, and that it is to be lined (I could make it using couture techniques). I did not like the sleeves, however – too baggy and shapeless. 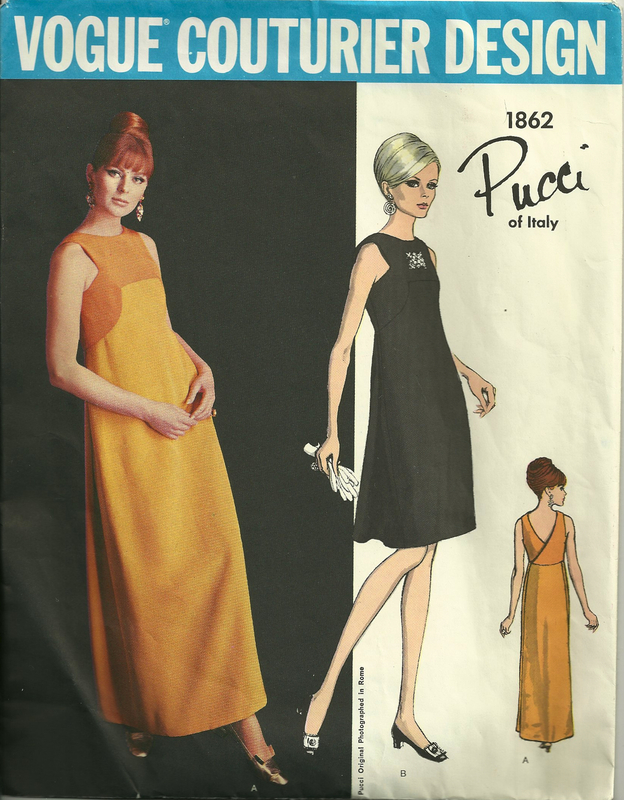 This presented two major problems, however, First, I do not own this vintage pattern (yet), which commands high prices when it comes on the market. And second, even if I did own it, my woven silk fabric would not be appropriate to use for it. Well, this second part of the equation was beginning to be a problem. 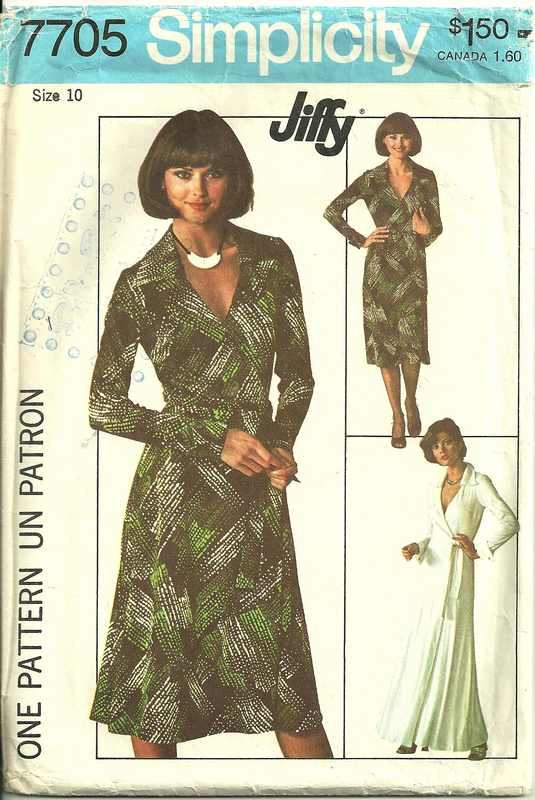 Then, quite by luck, I stumbled on a Simplicity pattern from 1976 in an Etsy store. The pattern is obviously a knock-off of the classic Diane von Furstenberg dress I like so much. However, it is for woven fabrics! It was in my size, which I took as a “sign” that I was supposed to buy it – which I did. I thought my search was over. 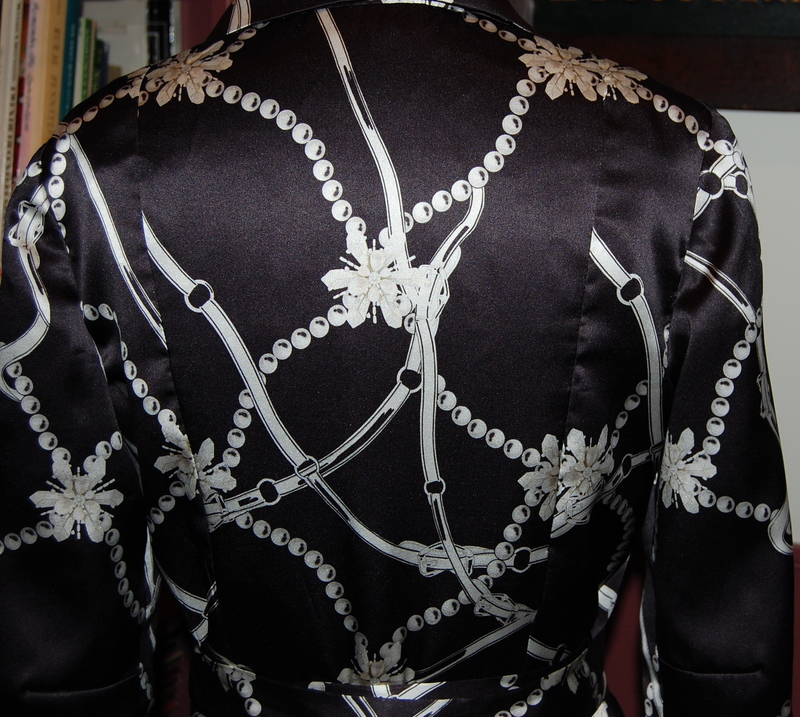 With a few minor adjustments to the “extreme” points on the collar and the cuffs, I felt sure this pattern would work. I really don’t think there is anything “JIffy” about this pattern . . .
A few weeks passed as life took me in other directions and with other projects. Then, finally, I eagerly started on the muslin for this dress. I was eager, that is, until I realized that the pattern piece for the sleeve is missing – and the pattern is going to require many more alterations than I usually have. There – I feel better now that I have said that! So my quest for the perfect pattern has been a challenge, but it’s not Fall yet. By hook or by crook, I’ll be wearing a new silk wrap dress before the trees gently release their leaves into the cool, crisp autumn air. What could be easier than this: a garment with no buttons and no buttonholes, secured by sashes which can be forgiving to your waistline and still be flattering? 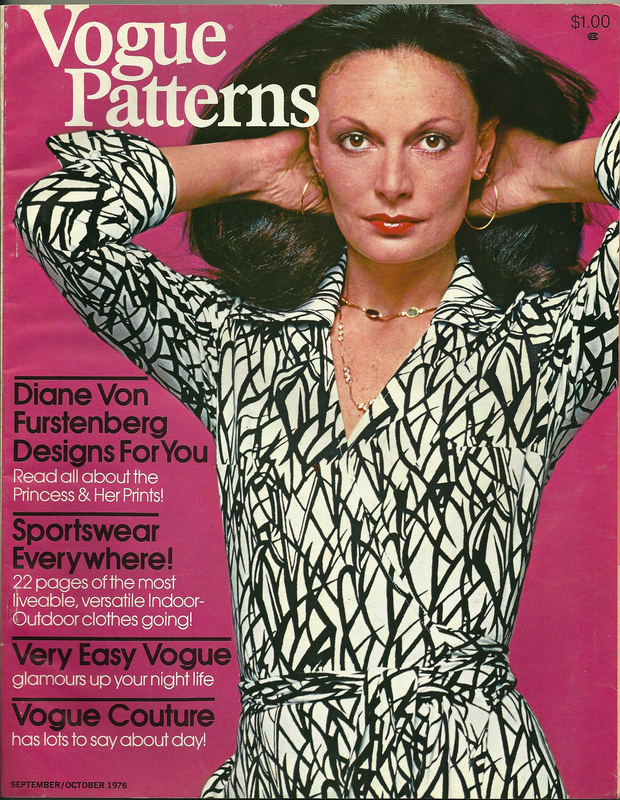 Diane Von Furstenberg immortalized the “wrap dress” in the early 1970s; its many variations became available to home dressmakers through the Vogue Patterns Designer series, and those original patterns now command significant prices on eBay and Etsy. 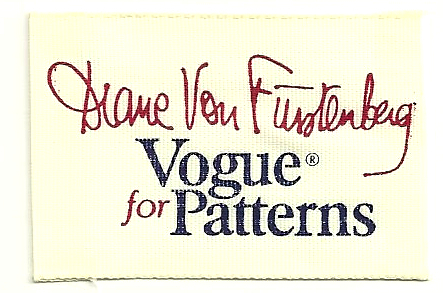 This is the label which was provided to purchasers of Diane Von Furstenberg patterns. But – what came before Von Furstenberg’s classic dress? 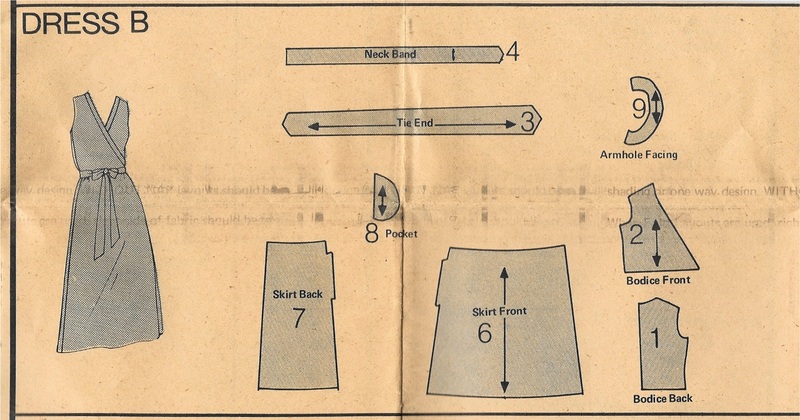 Many of us remember our “wraparound” skirts from the ‘60s and ‘70s – some were “reversible”, some were made of a lightweight sailcloth type of fabric and were kind of stiff, some were gathered, and some were A-line. Towards the late ‘60s, according to The Fairchild Dictionary of Fashion (3rd Edition, Fairchild Publications, Inc., New York, 2010), the term “wraparound” was shortened to just “wrap” – and that is the term we know and use today. The illustration in this book surely is based on DVF’s classic wrap dress. Who wouldn’t recognize this as a DVF dress? A classic style by Diane Von Furstenberg. This is a cotton twill, but it’s stretchable! The bright, happy design reminded me of some of the original DVF-designed fabric, although this fabric is actually by Oscar De La Renta. No, it wasn’t a stretchable knit which the pattern stipulated, but it was a stretch fabric, so I took a gamble and ordered it with my DVF pattern in mind. I actually liked the heavier weight of this fabric (I’ve never been a fan of sewing jersey knits), but I had to be extra diligent to minimize bulky seams on the interior of the dress. Instead of self pockets, I made the pockets out of some leftover white silk lining fabric from my raincoat. 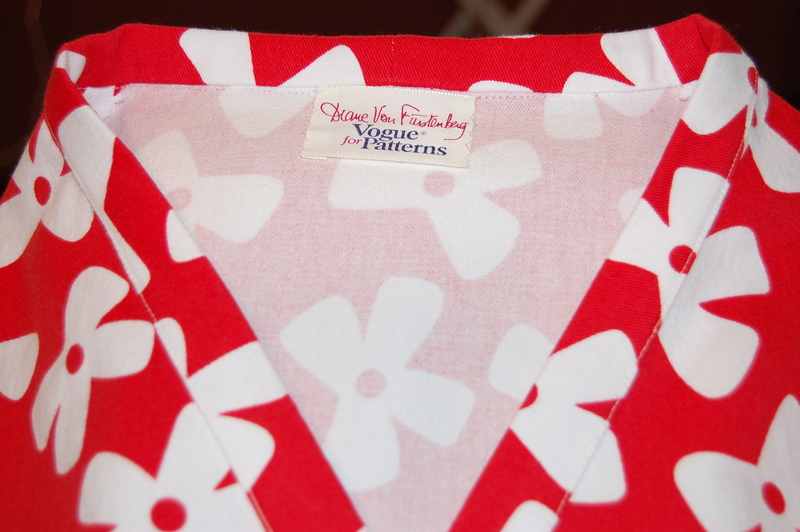 This cheery fabric could brighten any day! A bit of a back view. My final stitches on this dress were to attach the label. Feminine, timeless, versatile: her dresses are more than fashion – they are enduring style.